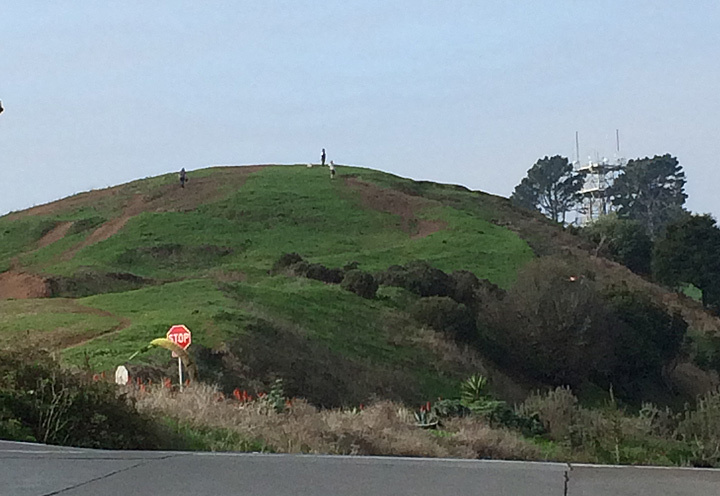 Bernal Heights after winter rains, January 2018. Mayflower Garden steps and foliage. 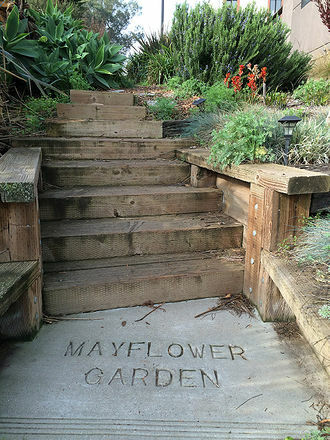 Founded in 2005 by Julian Wyler, The Friends of Bernal Gardens (TFBG) is a grassroots organization dedicated to the transformation and maintenance of blighted public spaces into weed free gardens that reclaim habitat for bees, butterflies, and birds, as well as promoting community pride. TFBG began in 2005 by establishing Mayflower Garden, then Carver Garden in 2007, Vista Pointe Garden in 2011, and the BH Blvd Gardens in 2013. Moreover, TFBG also maintains the Blvd Stair Gardens, and has contributed to several adjacent blvd stair gardens. For many, the public garden volunteer experience is an ideal opportunity to join with others who appreciate the beauty of our shared public landscape. 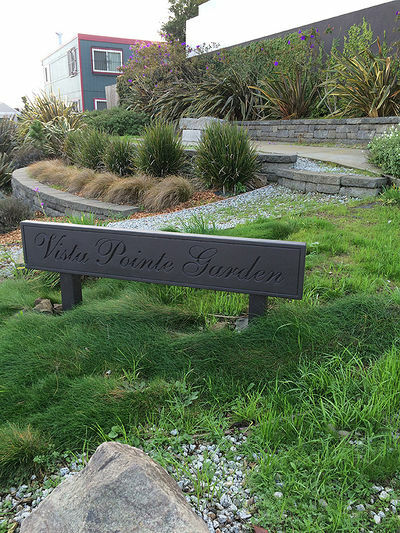 In 2009, the Friends of Bernal Gardens applied for and was awarded a $60,000 from the Mayor’s Office Community Challenge Grant Program to establish Vista Pointe Garden, with fiscal sponsorship from the San Francisco Parks Alliance. The City’s Department of Public Works Street Parks Program director Sandra Zuniga coordinated the installation and dedication. The garden was designed and directed by Julian Wyler and Tilden Landscaping assisted in the construction. The garden was dedicated on June 21, 2011 by Mayor Ed Lee to the volunteers who made it a reality and to those who would come to enjoy and appreciate it over time. Vista Pointe Garden consists of engineered retaining walls, both native and sustainable drought resistant plants, a drip irrigation system, and is wheelchair accessible. The prominent granite bench—once a city curb—looks out on panoramic views of Bernal Park, the Mission, the Golden Gate Bridge, Twin Peaks, Potrero Hill, the evolving San Francisco downtown skyline, the Bay Bridge, and San Francisco Bay. More info available at The Parks Alliance website.